Patients have a choice between pay-as-you-go care or joining our capitation system. Our charges are extremely competitive and we provide a full list of different options available and written estimates for each treatment. 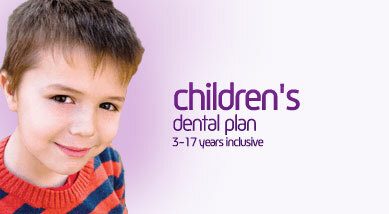 We encourage new patients to go onto our dental plan to spread their costs and receive discounted member's prices. For more extensive courses of treatment we provide 0% finance subject to status. For a practice information pack and full list of prices please contact the practice. Many people are prone to gum disease. To avoid losing teeth because of gum disease your dental professional may reccommend more regular visits to your dental hygienist. That way the gum tissues which keep the teeth on place remain strong and can help prevent any bone loss in the future. Gum care plan includes everything in the adult plan but in addition 4x 20 minute appointments with the hygienist. Gum care plan includes everything in adult plan but in addition 4x 40 minute appointments with the hygienist. Emergency Callout cover can be provided by any dentist worldwide who agrees to treat you. You simply pay the emergency callout charge to the dentist concerned and collect a receipted invoice. This will then be processed through the practice for reimbursement from the insurers and you will be refunded the callout fee, minus the excess, up to the policy limits. This cover is to provide immediate pain relief only; no additional or restorative treatment fees can be claimed. You should return to the practice in normal hours for any further treatment required. Dental Trauma cover is provided should you be unfortunate enough to suffer a dental trauma, for example, as a result of a road traffic accident or an accident at home or at work. The insurers will settle the claim up to the policy limits and you will need to pay any relevant excess. Hospitalisation benefit is provided should you have to stay in hospital as a result of dental trauma. Permanent Facial Disfigurement benefit is provided should you be scarred on the neck or face as a result of the accident. Oral Cancer a payment will be paid upon diagnosis of oral cancer. Redundancy Protection plan premiums paid for up to one year (not included in the Registration and Insurance Scheme).